Only twenty minutes from New York City, Bloomfield, New Jersey, is the place to start a life outside the big city. Rail commuter lines run into New York and buses commute into Newark, New Jersey on a regular basis. All of this gives residents easy access to the best shows, shopping, and activity, while avoiding the crime and crowds found amidst the skyscrapers. Prospective homebuyers will love it here, as there’s always plenty to do in town. A newly revitalized downtown area includes housing, restaurants, and shopping. Additionally, ten city parks offer plenty to do for all ages, from adult yoga classes to video game tournaments to dance lessons. Brooksdale Park, on the northern side of the town, was designed by well-known landscape artist Frederick Law Olmsted, and affords opportunities to enjoy its scenic beauty and some fresh air. For those that prefer the indoors, the Bloomfield Historic Society operates a museum in the public library with artifacts going back to the original town charter in 1654. Meanwhile, Bloomfield’s Arts community has constant listings for plays, concerts, bands, and dances. With an award winning school system, Bloomfield is also a great place to raise children. Eleven schools serve students kindergarten through twelfth grade, with a student to teacher ratio of 12 to 1. The town is also home to Bloomfield College, a liberal arts college founded in 1868, and today the college is home to more than 2,000 students. It offers classes in Nursing, Social and Behavioral, Education, and Business, and is fast becoming a destination school of choice by students from across the country. With all of these remarkable features and amenities, Bloomfield is a must-consider destination for homebuyers relocating in Northern New Jersey. Homes for sale in Bloomfield include properties of diverse sizes and styles in an equally broad price range. 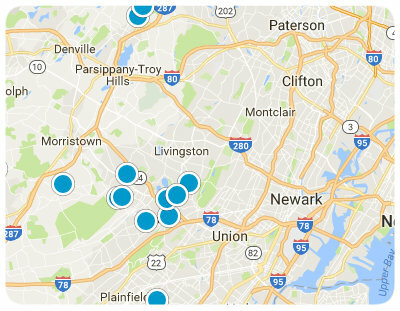 For more information regarding real estate in Bloomfield, New Jersey, please contact us today.